Burning Quads & Side Stitches? Chasing your buds down singletrack r i b b o n s , t o s s i n g p o s t- r i d e g a i n e r s i n t o chilly mountain lakes and sleeping under the stars waiting to do it all againâ&#x20AC;&#x201D;we live for days like these, and w e buil t t he ne w R ap t or/ R a v en s er ie s to suppor t them. With an updated wing-shaped harness for stabilit y and comfor t , plus premium features like a tool roll organizer and an included 2 . 5 - l i t e r r e s e r v o i r, t h e R a p t o r / R a v e n series delivers ever y thing you need, for big rides and good times. Keith Garvey has a new take on guiding in the San Juan Mountains. How one group is breaking trail and changing lives on the Navajo Nation. 56 MAKING WAVE S I N TH E GRAND CANYO N Meet the first women to raft the Grand Canyon. Stop by and let our friendly, expert staff help you with all your running needs. S U B S C R I B E Adventure Pro is now available wherever you roam. © 2019 All Rights Reserved. No part of this publication may be reproduced without written permission from the publisher. Published in the United States by Ballantine Communications, Inc. – 1275 Main Ave., Durango, CO 81301. 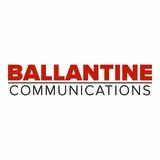 Ballantine Communications uses reasonable effort to include accurate and up-to-date information for its special publications. Details are subject to change, so please check ahead. The publisher accepts no responsibility for any consequences arising from the use of this guide. We welcome suggestions from readers. Please write to the editor at the address above. computers in the world, and it’s in our pocket. We learn the planets, the stars, the constellations and the mountains below them. We learn how to never get lost, or we learn exactly how we can. We learn that a new take on an old friend isn’t always bad, and that e-bikes are about as fun as fun can be. We learn how women are changing the outdoors for the better, and how guides and scientists are changing the way we can mix a love for adventure with a career. Most important, we learn that this place we call home is ever-changing. The colors, the sunsets, the way we live our lives. And that just when we thought another storm was coming, the sun burns through the clouds. So we think Anker is right. Early morning does hold all the promise. And spring is filled with it. 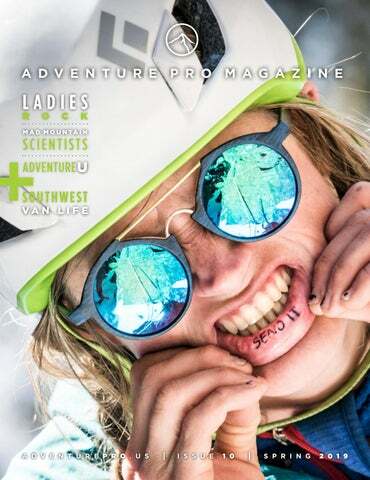 Hope you enjoy this new issue of Adventure Pro Magazine, and we’ll see you on the trails. likes playing outside and is rarely home in time for dinner — unless, of course, dinner is rehydrated in an insulated bag. She also enjoys writing about the outdoors, as well as history, science and travel. A Durangatang since 2011, Margaret also works in the outdoor industry, managing marketing and events at Backcountry Experience. When she isn’t writing or working, Margaret is in the mountains — running, climbing or splitboarding. with words and a camera. Living most of the year out of her Jeep, in this issue Morgan chats with Four Corners local Vernan Kee about RezRoads and the Native perspective of Van Life. Morgan's own perception of "living the dream" remains on the edge: She woke up in Silverton on a -22 degree morning to ski into the mountains with the scientists taking snowpack water samples near the Gold King Mine to write and photograph "The Mad Ski Scientists Of Silverton." Her next book "Outlandish: Fuel Your Epic" will enter the wild this May. MORGAN TILTON is an Adventure Journalist that writes about the outdoors with a focus in travel, industry news and human endurance. She is a recipient of multiple North American Travel Journalists Association awards, including a recent accolade for “Connecting with Tarahumara through Trail Running,” an essay about befriending the indigenous community of the Copper Canyon through shared experience. At the moment, she’s recovering from a remote jungle expedition — stay tuned for the upcoming story — and is stoked to go splitboarding or ice climbing in the Elks and San Juans, pronto. She works with close to 50 publications. Enjoy nature, art, and peace of mind in the comfort of your own backyard. Built in long-term environmentally friendly ways, TreeNet Willy’s platforms specialize in the highest level of net construction and rigging, providing a sturdy and clean finished product that will last for years to come. Great for all ages! Contact Will today for a free quote! 970.403.2012 • treenetwillys@gmail.com www.treenetwillys.com View past & current projects at instagram and Facebook! NEW PROMASTER IN PROGRESS AND FOR SALE! M O U N TA I N V I TA L S These women have rocked the boat in the outdoors, and they did it by just being themselves. From a soccer player turned cycling champion, a southern belle turned world renowned alpinist, a public lands advocate teaching a nation of outdoor leaders about the future of mountain guides everywhere, these ladies rock. Meet the women changing the face of the outdoors. Don’t let the name fool you. This nationwide organization stretches from Hawaii to Maine and every state in between, with 40 chapters of dedicated wilderness advocates working locally to protect public lands and wildlife. And Shelley Silbert orchestrates it from the home office in Durango, Colorado. “Our leaders come from all different backgrounds, all walks of life,” she says. “They’re retired forest service biologists or retired lawyers or retired doctors who understand the health impacts of environmental issues. And what makes our grassroots groups so powerful is that they are combining all of their skills with their passion for wilderness, and magnify the impact of our small organization.” The “Broads,” as they refer to themselves, work hard but play hard too. “We like to think of ourselves having fun doing serious work, Silbert says.” The Broads create Broad Bands, which are collected groups of stewardship advocates that set out to make a difference in their own territories. Every year they hold a training rendezvous called W.A.L.T.S. : wilderness advocacy leadership trainings sessions. Ghost Walk Durango Take a walk through 140 years of haunted history in the heart of the Rocky Mountains. Ghost Walk Durango is a guided walking tour starting at the Old Durango High School (201 East 12th Street) through the historic district of Durango, Colorado. Gun battles, including the Stockton Gang and the Simmons Gang feud, lynchings, and the Spanish Flu epidemic have all contributed to the folklore and legends that have been carefully preserved from generations of local storytellers. As educational as it is fun, Ghost Walk Durango is one of Durango’s most popular attractions and a sure bet for fun and thrills. Perfect for families, couples and kids from 1-101. Tickets $15 · Kids 10 & under FREE!!! Coffee is GREAT but even BETTER with a friend! Since 1976, Pine Needle Mountaineering has offered the top brands for all of your adventure needs. Whether youâ&#x20AC;&#x2122;re backcountry or alpine skiing, camping, backpacking, climbing, trail running or just stocking up on new gear and apparel, we have you covered. Fashion meets function in these ready-foranything jeans Take your favorite pair of denim, give them some comforting stretch, a little moisture wicking ability and a sophisticated look and you’ve got a pair of pants almost too good to be true. Who does that? DUER does. When denim industry veteran Gary Lenett fell in love with cycling, he found that blue jeans weren’t made for life in the saddle. Then he teamed up with performance fabrics forerunner Abid Hafeez, and the two took the look and style of denim and paired it with natural features and a utilitarian function to create DUER. The idea caught on and people won’t take them off. “We wanted to bridge the gap between fashion and performance clothing,” Lenett says. “By combining premium, natural fiber-rich fabrics with technical fibers, DUER offers extreme comfort, breathability and maneuverability, so you can look good and get on with the good stuff.” This is a jean you could wear to a date-night dinner and then go climbing or hiking in the next day. They are also perfect for bicycle commuters or anyone who enjoys a comfy fit with all the perks of an outdoor-minded active pant. We’ve climbed, commuted, slept and road tripped in this practical pant, and we are hooked. With several lines of men and women’s jeans and other garments, they all have the DUER do-anything chops. Our test pair of Relaxed Fit Performance Denim came in a Heritage Rinse wash with triple stitching for durability, and a gusseted crotch that adds to their freedom of movement and eliminates the intersecting pain point encountered in most pants. Plus the COOLMAX interwoven fibers wicked sweat and kept us cool when things got tough. At first we did a double take, but then we confirmed it: There’s a margarita on the index finger of these gloves. Where most glove manufacturers add some latex stripes or dots for tenacity on a brake lever, Hand Up added a taco and a cocktail. And that’s the vibe you get from this Tennessee-based cycling apparel company. They're in it for the fun. At less than 30 bucks a pop for a nice-fitting and relatively non-traditional looking pair of gloves, our “Taco’d Taco - Tuesday” pair felt just right, right out of the box. Described as bold and minimal, there’s not much to them. And that’s almost perfect. They may be bold for being minimal, but they are bolder still for the themes and designs they market: tacos, flags, palm trees, graffiti, rainbows and more. They make custom gloves also. What we love is the lack of padding. Hand Up uses a simple design with a lack of overkill. This is a sensitive glove that lets you feel everything — bumps included. If you like a mushy squeeze on the bars then keep shopping. There is a thin synthetic and tough material on the palm, a breathable mesh on the back of the hand and the quintessential soft-swipe thumb sweat and booger remover. For a price this nice and a fit this good, we have to hand it to Hand Up. Today — 100 years later — the company, still located in Tacoma, offers a variety of products designed to meet the challenges of wet weather. It has refined their practice and embraced the rigors of the outdoors. From copy paper, spiral, bound and stapled notebooks, index card holders to aesthetically pleasing journals, wallets, book covers and even writing implements, Rite in the Rain products are well-known for their undeniable and utilitarian functionality. Our notebook came with a grid-patterned paper great for measurements, blueprints, keeping to scale and details. The writing utensils are just as burly. The All Weather Clicker Pen we tested came with a pressurized ink cartridge good from -30 to 250 degrees Fahrenheit. Plus it writes upside down. From sweating over a journal in the desert to taking notes in a snowstorm, you can put pen to paper anywhere, anytime with these rugged, handy travel companions. corrected amino acid score) plant-based protein with a complex profile of macro- and micro-nutrients. With 24 vitamins and minerals, they are also loaded with 50 grams of carbs, 30 grams of protein, 6 grams of fiber and healthy fats. Surprisingly, there is only 1 gram of sugar in the 400-calories-per-serving shake. Not only are they a smart choice for when it looks like meals are out of the question, odds are they are a smart choice over some of the meals we eat. We’ve tested them two ways: that hectic office day where lunch wasn’t an option, and a weekend morning heading for the mountains. Whether we were getting crushed by spreadsheets or crushing vertical in the hills, we were doing fine with our Parachute. Don’t expect a French vanilla malt here, because a Parachute isn’t dessert. (Right now, the shakes come in only one flavor, but Patton says new flavors are on the way.) Parachute shakes catch you so don’t hit bottom, but they also provide a healthy alternative to what might have been for lunch. town in all conditions. These boots are perfect for zombie market runs or other playfirst, be-responsible-later errands, and are a godsend for playing fetch with the dog in spring backyards. Plus, while it is early, it is safe to say we have found our go-to footwear for chilly-trailer life trips. Pakems are an outdoor slipper — like a house shoe with crampons — so don't let that comfort fool you. Pack them up to take them with you. You’ll be glad you did. SUBSCRIBE! ADVENTURE PRO IS AVAILABLE WHEREVER YOU ROAM. That’s right, it is a tiny computer in your pocket, and it’s seriously pretty powerful – more powerful than all of NASA in its entirety in 1969, as a matter of fact. Are we landing people on the moon every time we check our phone? Nope. We’re spending our lives posting selfies and watching cats freak out at bananas. But we can put that pocket computer to some incredible use. Even when we’re outdoors and on adventures, it can bring amazing information to light. In fact, that might be some of the coolest stuff that your phone can do. So stop scrolling and start learning. These apps can change the way you see the world. SKYVIEW SkyView provides endless hours of wonder and learning about things you never knew. It’s like PeakVisor, but for the night sky. It uses date, time, location and your camera to determine where you are in relation to the stars. Simply hold your phone up to the sky and SkyView will highlight what’s out there. Hover over the constellations and the app will magically connect the dots for you. Suddenly it will reveal how they are interpreted. SkyView Identifies planets as they are are emphasized, and it reveals horizon levels and even satellites positions. will trace a digital overlay of what’s on your screen with names and elevations of peaks, plus some topography details. It features local search functionality, map coverage, works offline and the 3D compass maps include trails. It also knows other landmarks, like waterfalls, and can predict the movement of the sun — a handy tool for photographers or for planning camps. With PeakVisor you get to know the world around you. open it even if they don’t have the app.. It will even showcase the exact location of the photos you took along your journey. Relive has become a favorite for many app-obsessed phone owners (guilty as charged). It’s a personalized media event that’s all yours, and it’s a great way to see the landscape you just covered. Get the beta and a bird’s eye view, and bask in the glory of what you just accomplished. climbing to decorative knots, and even neckties and household uses, this is the ultimate handy guide to tying it all together. Climbers can geek out over this, but it’s far more utilitarian. Practice with a shoestring at your desk and then save the day in real life with a trucker’s hitch, bottle sling, bowline or alpine butterfly. checked our map but had a funny feeling it didn’t have all the roads on it; plus it was dark, cold and we were cooked. We pulled out our phone, turned it on and opened the Hiking Project app to get our bearings. Seven miles later we were eating chocolate chip cookies at our car. The app is not only free to download, but it is also free of advertising. REI’s selection of trail and climbing apps include Trail Project, Mountain Bike Project and Mountain Project, and they are all an asset to trail and climbing enthusiasts. a collection of what you have found. But what is really impressive is its use of your phone’s camera to actually identify plants; hence, the snap part of the name. Simply focus on the plant in question, snap it and Leafsnap will identify it. It’s an app good for budding naturalists. Plus, now you can tell the difference between wild garlic and the toxic Lily of the valley — two easily and commonly confused plants. brown recluse spiders, venomous snakes and their bites, how to recognize anaphylactic shock and what to do, how to handle broken bones and much more. This is a great app to peruse before you need it. Instead of posting a mood update on social media, you could be learning how to treat heat exhaustion or familiarize yourself with CPR. have something in mind for a particular date, you just might be able to find it. Need a spot for four next Saturday with two dogs that's close to water in the desert? Done. Looking for that cabin in the woods close to town for Solstice? Got it. According to Hipcamp, it’s their mission to get more people outside, and access to the outdoors is the key. “We’re firm believers that people will protect only what they connect to and care about,” according to the company’s website. Hipcamp isn’t a mobile app yet, but it makes it easy for campers to find what they’re looking for and an easy place for camp hosts to list their campsites. service but another provider does, federal regulation requires the functioning carrier to allow the call to go through. Good to know. Lease Program Star ting at $160/year! Come In For A Test Ride Today! Bring Your Taste-Buds The Strater Experience is an adventure for your family and friends. Start your day with fantastic eggs Benedict or cinnamon pecan french toast when you have Breakfast At The Mahogany. And then join us for an authentic western saloon experience at The Diamond Belle; craft cocktails at The Office; and finish with steaks and seafood at The Mahogany Grille. The motor case on a Yuba electric cargo bike. Major manufacturers like Bosch, of power tool fame, are making incredibly efficient, long-lasting batteries and motors ideal for e-bikes. And while some say it’s tarnishing cycling’s image, “This is hunting. We want to be quiet,” he says. others say it’s making the world a better place. True, QuietKat is also marketing an enduro high-end they’re not cheap; they range from $2,000 to $5,000. They mountain bike. E-bikes are making their way onto rely on a big ol’ battery for power, lasting from 30 to 100 the enduro scene, where riders shuttle themselves up miles. Like the modern car, most bikes mountains and then fly back down. From will need regular firmware updates. Your here, Spinks says people are finding mechanic will hook up your e-bike to an new applications, from bikepacking to app and wait for diagnostics. photography. The bikes also play a role in keeping Graveson, in Durango, says e-bikes I think when people out of traffic and out of polluting will soon be as common as any other people try it, cars. Imagine a mountain town where half bicycle. the population rode e-bikes instead of “Even if you’re the most fit person, it becomes a driving cars. That’s half the congestion, half it’s still nice to ride,” he says. “You don’t no-brainer. the emissions, and half the parking tickets. have to think about it. You can wear More people on “You could park your car eight or nine your normal clothes and cruise along to months out of the year,” says Mike Phillips work. It’s kind of nice.” bikes is always of Mountain Bike Specialists in Durango. In ski and mountain towns across the a good thing. “I think when people try it, it becomes a West, there are so many cyclists it’s hard no-brainer. More people on bikes is always a to decipher who’s on what. But does good thing.” it matter? If more people are riding, Phillips says most of their e-bike maybe that’s all that really counts. customers are commuter-minded, looking for ways to get more time in the saddle without gearing E-bikes have a growing commuter niche in the U.S., but mountain towns in up and getting dirty. the West are seeing rapid growth and popularity in utility- and cargo-style Diane Manuppella of Colorado E Bikes in Grand Junction, bikes, like this model from Yuba. Colorado says her customers aren’t looking for gritty exercise; they are looking for ways to enjoy the outdoors. “I find our clients are people looking for that extra activity,” she says. “Whether it’s golfing or motor-homing, they’re just looking for that extra outing. Maybe they weren’t into bikes because of a physical ailment or something like that. Biking is available now. They can do it.” In Eagle, Colorado, a company called QuietKat is taking e-bikes on the game trail. “Ours are built to be a high-powered utility piece,” says Ryan Spinks. “You carry your gear in and all of your game out.” QuietKats are powerful fatbiking e-bikes, designed to replace ATVs. It might be hard to envision a camouflaged hunter riding off into the woods with a rifle on their back, but Spinks says it’s perfect. The official MSI Mobile Snow Office. Loading up the snowmobile for a big day of work in the backcountry. Nate Rock hops off a snowmobile and sets up his skis among several gallon jugs of antifreeze. In what looks and sounds like the sequel to “Breaking Bad,” we load up our packs with the brightly colored chemicals and prepare to skin up to a secret lab hidden in the pines. In his new life reincarnation as a research associate and field manager for Mountain Studies Institute based in Durango, Colorado, Rock now skis as much as ever for what can literally be explained only by science. “I was a recovering ski bum and needed something to do with my life besides wait tables,” Rock says. Rock works alongside MSI Research Director and Hydrologist Rory Cowie who, born and raised in Maine, learned to ski as soon as he could walk. Both fell in love with the San Juan Mountains and consider themselves fortunate to call this place home thanks to their multidimensional skills with frozen water. “We combine the scientific skill sets to perform field measurements and sampling tasks in harsh conditions with ability to access remote locations (and) sites in the winter via backcountry skiing,” Cowie says. Beyond the obvious, he explains the essential details of their job description. “We have to have avalanche safety training and be fairly competent backcountry travelers/skiers to safely access sites and perform maintenance or repairs on instrumentation,” he says. I take sips of black coffee as I prepare to join these “fairly competent skiers” (quite the sandbag) in the backcountry to photograph and observe their day-to-day duties. My expectations immediately go out the window as I wrongly assume that we will be skinning the entire way up the mountain. With such a heavy load of gear and equipment, the guys take a snowmobile as far as safely possible most days of the week. They love traveling by human power, but given their workload they have to consider their physical durability as well. Fair enough. They instruct me to stand on the left side of the snowmobile, skis strapped to my back, as Rock drives and steers from the right and tows Cowie on his skis from the back. My first ever ride on a snowmobile is already one I will never forget. We don avalanche beacons and bright yellow safety vests, which I pull over my three layers of ski gear. It was -22 degrees when I woke up this morning. Try skiing with 30 pounds of anti-freeze in your pack. drain and empty the collector-gauge to prevent it from overflowing. While our mode of transport is on the knife edge, it isn’t as straight-laced as two scientists checking snowpack, Cowie explains. “The ultimate goal is to reduce pollution in the form of metals levels in the Animas River watershed.” There are 48 listed mine sites within the Bonita Peak Mining District Superfund site that have been listed as having some amount of contribution to this pollution. Amid the fervent battles on our public lands, especially in the Southwest, the potential for mining and oil drilling in new areas sits at the height of everyone’s concerns. And yet, we are still cleaning up the messes of the holes our forefathers blasted into the earth in the last century (mining in this zone began around 1870). And, in fact, even cleaning them up is not without inherent risk. In 2015 the Gold King Mine, just below us on this ridge, spilled 3 million gallons of contaminated sludge into surrounding waterways during routine EPA clean up procedures. Cowie describes a tunnel that connects a nearby mountain with the town of Ouray along with the current system of using cement plugs to stop the spills. How long will they hold, I wonder? He shrugs his shoulders. “We are still waiting to find out,” he says. According to the EPA, the activity in the Bonita Peak district has impacted water quality by the mines for decades. The legacy of mining in the West remains heavy, deep and largely unknown. Mad scientist Rock steers the crew on a wild path to the hidden lab. Cowie prepares to go deep into the test station with a set of rubber beaver gloves. 30-ish pounds. I almost feel guilty about not pulling my weight, but then again, I look like a baby deer learning to walk, and I need to survive the descent and snap photos of these finely tuned lab rats in their element. Skinning back up to the peak of our journey, the guys stop and coach me on my technique. I’m mildly embarrassed until they tell me about a New York Times reporter who had to wait for them at the bottom. I pull my tail from between my skis and prepare to “drop in” to a slope far below the 45-degree standard. There’s nothing to report here, but as the mad scientists are about to enjoy what they consider the best part of their job, I yell for them to hold off, because my camera battery has succumbed to the cold. With frozen fingers, I swap it out and wave them on to proceed. They slip down the slope like butter across a warm pan and my fingers trigger the shutter just fast enough to score a few photos before the final and inevitable battery freeze. Back at our chariot, the guys note some mechanical issues and I opt to skin down the hill to stay warm. I make it all the way down and wait in the sun until I hear the buzz of the snowmobile. Both men emerge looking as free and happy as anyone in the mountains right now despite being on the clock. Rock takes the turns on the snowmobile with complete control and Cowie flies down the trees, landing a final jump off the snowy road precipice right into the parking lot. Their previous lives as ski bums clearly set them up to strike a new kind of gold — the kind where athleticism and science converge to help clean up a dirty mining past. Skinning up to the lab with only a few essentials. International mountain guide Keith Garvey demonstrates how to set a precise, European-style skin track. Garvey cut his teeth working in the European Alps for 14 years. the high-alpine of Southwest Colorado, Peak Mountain Guides is on a mission to emulate the iconic hut-to-hut routes of the European Alps. International mountain guide Keith Garvey rips the skins while leading our tour above the Thelma Hut in the San Juan Mountains. Keith Garvey, co-owner of Peak Mountain Guides in Ouray, Colorado, is one of only 150 people in the U.S. with the international-level certification IFMGA (International Federation of Mountain Guides Associations). photo by Xander Bianchi. “Visitors who are unfamiliar with the snowpack and than in the states. Now, he hopes to improve the topography, or have low abilities and experience levels industry standards by offering competitive rates. in backcountry travel, have limited terrain choices,” Professionals with an IFMGA license or American says hut-keeper Matt Guertin, who also operates the Mountain Guides Association credentials who lead Opus and High Camp huts. “The key is maneuvering trips in their scope of practice — be it up rock, on skis, your way through safe ground to reach great runs. or in icy, alpine terrain — can earn up to $450 per Hiring a mountain guide is crucial.” day. By comparison, most U.S. guide companies offer For Thelma’s inaugural season, Guertin’s guests have a maximum of $225 per day, Garvey says. arrived from across the country including New York, Garvey’s experience abroad inspired our trip today New Mexico, Durango and the Front and his vision of the “San Juan Range. Some folks opt to snowshoe Haute Route,” the country’s firstin and don’t ski at all, and others are ever guided hut-to-hut trips that constrained by an unfamiliarity with blend high-alpine terrain with topavalanche-prone areas. end lodging and enable adventurers Everyone takes “About one-third of our visitors to pack light. Garvey’s ideal highuse guides,” he says. “But it should route variation will include off-piste the same route be more. A guide provides confident, and in-bounds turns that link up and moguls safe terrain selection and people can the Opus, Observatory, Thelma scatter the runs. get a lot more skiing in.” and Hayden huts. The lattermost is Ski touring is our goal. My trio of being built in Richmond Basin, at Here? You see backcountry partners has completed the end of Camp Bird Road, gateway no one the recreational avalanche courses to 14,150-foot Mt Sneffels, and is designed by the American Institute scheduled to open next season. The for Avalanche Research and four-day journey will be EuropeanEducation. But this morning, the esque — but better. CAIC forecast for our region is high: the snowpack is “In Europe, you see 100 people waiting for fickle and extra dangerous. Fortunately, our team breakfast at a hut and standing nose-to-backside includes Peak Mountain Guides co-owner Keith Garvey, on the skin track,” Garvey says. “Everyone takes the who is licensed by the International Federation of same route and moguls scatter the runs. Here? You Mountain Guides Associations: the highest credential see no one.” for professional mountain guides worldwide. Only 150 After a mellow morning and homemade porridge, IFMGA-certified guides are from the U.S., out of 6,000 we venture into the freezing blizzard and up lowtotal. And per Garvey’s mission, PMG has employed 15 of angle contours. From our perch above tree line, there those experts this year alone. are no sounds, tracks or crowds in sight. As I drop Among his 22-year career, Garvey spent 14 seasons into our first run, I carve into the blank canvas and working in the Alps, where guide wages are higher I’m refreshed by the solitude. High over Thelma Hut, which is perched near an elevation of 11,300 feet. Adventure writer Morgan Tilton finds the goods — in safe, low-angle terrain — in the San Juans, her home mountains. The Thelma Hut has three sleeping areas, all in modern-rustic style. Here, the bunk room is fully furnished with down comforters atop four comfortable beds. OFF THE GRID DOESN’T HAVE TO MEAN ON THE GROUND There’s a reason even the smallest RVs include a bed. Because you should never have to sacrifice a good night’s sleep, even on the most rugged of adventures. B R A N D O N M AT H I S the sage and pinion pines that line the mesa. Small pelotons of cyclists whiz down roads. Skis, snowboards and kayaks rest on cars. It’s a fitting place for students who embrace the outdoors, but better yet a place primed to entice newcomers with the call of adventure. Adventure education classes often take place in the wild. photo by Nate Decremer. PURSUE THE OUTDOORS The Student Life Center is a campus gem. It’s a health club, plus a full service bike shop and headquarters of the college’s Outdoor Pursuits Program — a campus based guide service/outfitter. It’s part gear shack, part trip planner, all outdoors. Patrons of “OP” can do anything from a guided snowshoe hike, to learn avalanche skills, to ride nearby singletrack, to backpack into the wilderness or even summit some of the world’s tallest peaks. Not bad for a program that started 40 years ago with a few sleeping bags and backpacks. In 1977, FLC faculty member Dolph Kuss and student John Bird wanted to created a program to support the needs of students interested in the outdoors. Kuss was already instrumental in developing ski programs, working with the parks and recreation programs put on by the city of Durango, and Bird was an avid member of a young and growing climbing community. With modest funding and a few pieces of gear, Outdoor Pursuits was developed. In the following 40 years, OP would become a hub for aspiring outdoor-oriented students living and studying on Colorado’s so-called “campus in the sky.” “The whole deal is to get students outside to explore the Four Corners and broaden their world,” says Brett Davis, assistant director of recreational services at FLC. His office is stacked with guidebooks and maps. Skis fill the corner behind the door. The walls are layered with overlapped photographs of trips from around the world. Cataract Canyon; Colorado River, Utah. photo by Colt Fetters. Adventure education in slot canyons. photo by Nate Decremer. Prospect Basin; Red Mountain Pass, Colorado. photo by Colt Fetters. Castle Valley, Utah. photo by Brett Davis. medicine, trained in emergency protocols and preparedness, have the ability to manage group dynamics and are conditioned to tackle technical backcountry environments. Somewhere in Utah; Outdoor Pursuits archives. LESSONS LEARNED Adventure Education staff lecturer Eli Shostak has worked around the world as an outdoor educator. With degrees in anthropology and experiential education, he says an AE degree shapes leaders. “When you look at our graduates you see a really wide spectrum of pursuits,” Shotstak says. “And I think what we do transfers no matter where they land.” Graduates of FLC’s Adventure Education program have become international guides, trip leaders with exotic tour companies, work in national parks and wilderness therapy or have continued on to advanced teaching degrees. The AE department is housed in two small buildings a little off the beaten path from the rest of campus. Classrooms are arranged with circular seating, and a kitchen of sorts is stocked with vats of dry foods and appliances for food preparation. The walls are coated with river maps. A door leads to a gear garage loaded with skis and boats, personal flotation devices and climbing ropes. Outside, utility trailers wait to be loaded for the next trip. Sound like camping for credit? Guess again. AE is a rigorous four-year degree with intense academic focus and a demanding out-of-classroom curriculum. Part of the study emphasizes core values like professionalism, experiential learning, environmental ethics and stewardship, diversity, empathy and compassion, critical thinking and civic engagement. Students study hard and carry those values into the field. programs are working, in part because of interest but also because of the unconventional and willing position of the college itself. “The students already have a mindset,” Davis says. “They want to be in the mountains. They may not want to climb this or that, they may just want to hike the nature trails, or mountain bike or go hammocking. We can cater to all of that. And the institution supports it.” Looks like it’s possible, after all. ADVENTURE EDUCATION TIMELINE 1941: Kurt Hahan and Lawrence Holt found Outward Bound to condition Navy sailors in the art of survival after combat. 1961: Outward Bound USA forms, facilitating establishment of the Peace Corps. Today Outward Bound operates in 33 countries. 1965: In Lander, Wyoming, the National Outdoor Leadership School is founded by a member of the Tenth Mountain Division, a military training division specializing in mountain warfare. Today NOLS operates on six continents, and has trained almost 300,000 students in wilderness, leadership and technical outdoor skills. ADVENTURE EDUCATION Hahn is considered a pioneer of adventure education. The concept was simultaneously developed in schools and institutions around Europe during World War II. Today there are 21 schools in U.S. that offer academic degrees in Adventure Education. San Juan River, Utah. photo by Brett Davis. When you look at our graduates you see a really wide spectrum of pursuit and I think what we do transfers no matter where they land. Drop off your own gear for sale on Friday, and pick up something new on Saturday! It's a great time to clear out your garage of all that extra bike stuff, and bring in some fresh swag! SETTING THE STANDARD FOR SILVERTON LODGING For the discerning guest looking for the ultimate place to stay in Silverton, The Benson delivers with a newly renovated facility, modern technology, and all the amenities you would find at home and then some. Among our designer living quarters and suites we also offer Wi-Fi, HDTVâ&#x20AC;&#x2122;s, Spa-Like Amenities, and a State of the Art Business Center. For the ultimate experience in Southwest Colorado, book yourself a suite at The Benson. COMING THIS SPRING! OFF ROAD TRAILERS MANUFACTURED IN DURANGO. TEARDROP AND OVERLAND STYLES. Grand Junction’s got a new angle on Colorado’s Western Slope. wenty years ago, there were rumors that the mountain biking around Grand Junction was pretty good. Today, the Grand Valley ranks with world class destinations, and it’s not just the mountain biking. Trail runners, road riders, hikers and backpackers, climbers and river runners make their way to the biggest city on Colorado’s Western Slope for fun. Instead of just passing through, take a day or three to check out life in the Grand. Twin brothers, David and Jonathan Foster, love coffee and it shows in their commitment to featuring the finer coffees from around the state. Think along the lines of a Colorado microbrewery but for coffee roasters. With a variety of brewing methods, the coffee aficionados at the Kiln know how important a good cup of Joe really is. Yes, that is the Colorado River that runs right by the edge of town, and it flows on through to a canyon country so stunning you won’t believe it’s still Colorado. Trail heads, look to the Lunch loops, where you can spin around buff singletrack or drop into some incredible white-knuckle terrain. Get warmed up on Miramonte, have some fun on Pete-Kes and get ready for the Holy Cross. This well-marked and contained trail system has it all. For the ripper in your crew, note how signs on Free Lunch are numbered for helicopter rescue. Head west to Fruita to hit the North Fruita Desert on 18 Road. Keep going and check out Rabbit Valley. Rock climbers can venture into the Colorado National Monument, or duck into Unaweep Canyon, where a galaxy of splitter crack climbing and open spaces await. Lemix Benally shares his excitement after his half marathon finish in Monument Valley in March. photo by Brandon Mathis. Tom Riggenbach, the race director and executive director of Navajo YES, can’t make it 20 feet without someone grabbing his attention. He briskly darts from tent to tent, meeting with officials, runners and runner’s family members, plus a few stops at his car to grab a mouthful of food. The run is just one component of an organization that Riggenbach and others founded in 1994 to promote health and wellness on the Navajo Nation. A teacher who landed on the nation in 1988, Riggenbach fell in love with the landscape and the people who lived there. “Originally we were mainly youth programs — backpacking, and biking with kids, which we still do a lot of,” he says. “But now we expanded to include the race series and big trail projects in communities across the rez.” Their mission is clear: to use the outdoors to create a path to healthy lifestyle choices and activities for about 350,000 Navajo Nation members. Socio-economic and health hurdles persist on the reservation, and the way Riggenbach sees it is simple. At the start and finish line, before each race Holiday recites a prayer in Navajo. He says events put on by Navajo YES are ways for visitors to learn about Navajo culture. Jason Bagody sets his pace for his 50-kilometer (32 miles) run throughout Monument Valley, just one of 16 events Navajo YES will host in 2019. photo by Brandon Mathis. Tom Riggenbach came to the Navajo Nation in 1988, and is now executive director of Navajo YES. While the organization was founded on youth empowerment, it’s growing to include all ages. “Look at this,” he says, “You’ve got kids cheering on their parents, grandparents. Everyone comes out for this.” photo by Brandon Mathis. More than 300,000 people live on the Navajo Nation, which spans Arizona, New Mexico and Utah. Places like Monument Valley Navajo Tribal Park on the Arizona/Utah border, have tremendous cultural significance. photo by Brandon Mathis. John Kinsel, Sr., a Navajo Code Talker, H&S Company, 9th Marine 3rd Marine Division 1942-45, greets Christian Gering recognition of his podium finish at a Navajo YES race in Monument Valley in March. photo by Brandon Mathis. Just like on the trail, light and right doesn’t mean being unprepared. It means being efficient. Think of where you are going and why. Be selective of what you want and what you need. Forget everything? Make a list. We don’t go anywhere without an Anker Power Core 1000 and our Aftershox Treks Titanium headphones. Smart watch? Don’t forget the power cord. And don’t be the guy shopping last minute for a pair of swim trunks after you’ve been invited to the hot springs. Forget checking baggage for a short trip. A carry-on is all you need. It really is the only way to fly. According to United Airlines, the maximum dimensions for a carry-on bag are 9 inches x 14 inches x 22 inches, and that means wheels, handles, straps — everything. Of course you get a personal item too, like the size of a messenger bag or small duffle in the ballpark of 9 inches x 10 inches x 17 inches. That’s perfect for a laptop, book, a device, water bottle, headphones and a notebook (the kind you actually write in) and inflatable pillow. Once you have your items set, here’s an effective strategy for packing and better organization, plus tips for airport security. When it comes to how to pack, even if it's the night before an early flight, catching a ride at the break of dawn or just heading south for the weekend, following these suggestions should have you better prepared and on your way. Don’t forget to bring back a souvenir. acking for short trips doesn’t have to be stressful. Make it a skill instead of a 01	Pscramble and never check a bag again — at least for trips of three to five days. C arry-ons are not only self-assuring, they’re cheap too. And while lost luggage is 02	declining (about six lost pieces for every 1,000 passengers according to SITA, an air travel information organization), in 2016 airlines in America collected over $4 billion in luggage fees. Skip the expense and carry it on. olling your articles of clothing will help you save space and pack 03	Rmore efficiently. to protect that laptop investment? Thule Sweden, a long-trusted maker of gear 04	Wandantbicycle carriers, have entered the luggage space and also make laptop bags and cases that can hold all of your electronics. live a life on the road, or at the gate, packable footwear is great for traveling 05	Iandf youcomfort. On a recent trip to Denver’s Outdoor Retailer show, we knew we’d need some double-duty clothes to look nice and to endure brisk walks around the city, but we’d also need room on the return trip. For any efficient packing, the key is to roll. You’ll be astonished at how rolling, not folding your items, will maximize capacity. When you're packing for short trips, think of it as if you were lining your luggage with your things, not just placing them in there. Think of shoes as little containers that can hold stuff and stuff them accordingly. Some footwear travels better than others. Companies like Lems and Sanuk make minimalist shoes that pack well and hold up out on the town or in the boardroom. Remember your glasses case, and put some packing tape on your contact solution lid so it doesn’t squirt all over your toothbrush. If you’re using a wheeled roller like the Osprey Transporter Wheeled Duffel (our favorite carry-on), heavy stuff like shoes and pants go on the bottom and lighter stuff goes up top. This will keep it sitting up right no matter what and make pulling it a breeze. With nonwheeled duffel style bags, strive for balanced weight. We all have a nice travel kit that holds our manly stuff. On short trips, leave it at home. A small pouch or even a ziplock baggie works just fine. Here's a clever tip: Keep all of your electronics together in your personal bag through airport security. That means laptops and cameras, power packs and lithium batteries and smaller items like watches and chargers. Afterwards, gizmos and accessories you don’t need to access while flying can get packed in your carry-on. Sometimes you’ll need to pull out batteries from devices. Three days means three shirts and two pair of pants at most, plus a pair of thin sweats for the VRBO. Make that a shacket. They look nice, but we just think of them as a button-up sweatshirt with a collar. When you're thinking of how to pack, consider if a run and/or working out is likely. If so, then a plastic bag for your sweaty clothes is a good move. Even if you only have one outfit, a fresh set of boxers and a clean pair of socks can make a new man. An empty soft flask water bottle like the Hydropak 500 ml is a great traveling convenience, especially once you get through security at the airport. Instead of forking over $3 for 12 ounces of water on a layover, refill your flask at the fountain. When flying, even though you’re (ideally) not checking bags and dealing with baggage claim, it’s good to be able to differentiate your stuff from the rest of the world’s. A piece of string, a label, or some kind of unique identification will help. Special Collections, J. Willard Marriott Library, The University of Utah. > Utah Photograph Collection, P0077 Green River, p0077n01_13_80. This photo has been altered from its original. The Grand Canyon is gray. Muddy black and white water crashes and surges. A handmade wooden boat jitters through the rapids at 18 frames per second. On board is a small, shorthaired woman in a cork helmet clutching the stern line. The newsmen describe her as a bespectacled “schoolma’am,” yet Dr. Elzada Clover is an accomplished botanist who has explored much of the Southwest. It’s the summer of 1938 and she will soon become the first woman to raft the Colorado River. The expedition was one of many firsts. With the entrepreneurial river rat Norm Nevills as its guide, the venture became the first commercial river trip on the Colorado. It was also the first botanical survey of the Grand Canyon along the river. Launching from Green River, Utah, the party floated over 600 dramatic miles to Lake Mead. Joining the expedition were two graduate students — Lois Jotter, an athletic and outdoorsy young woman, and Gene Atkinson, who had some experience with canoes. Nevills invited a photographer named Bill Gibson to document the journey, and LaPhene “Don” Harris, a surveyor with the United States Geological Survey. Whitewater rafting had yet become a recreational activity, and Nevills’ only criteria seemed to be a sense of adventure and strong arms. themselves and trying to work up a good excuse to quit at Lees Ferry.” In the end, Jotter stayed, but Atkinson and Harris left the expedition. Nevills replaced them with two local men – Lorin Bell and Del Reed. The change in morale was palpable. After their first day together, Nevills wrote, “This is a swell gang and we’re going to town!” Nevills often erred on the side of caution, choosing to avoid more dangerous rapids, but as the walls of the Grand Canyon grew steeper, whitewater was the only option. Clover and her companions ran many of the river’s most notable rapids. They arrived at Lake Mead on August 1 and were met by a crowd of onlookers hoping to ascertain what sort of women could do such a thing. It’s tempting to view Clover and Jotter through a modern lens and forget they were still bound by the constraints of the time. In addition to their work collecting plant specimens, the women cooked nearly every meal. Clover once wrote, “We have spoiled them completely.” Clover and Jotter were often photographed powdering their noses, as if to indicate they could still be feminine. And the worst — perhaps more so for Jotter than Clover — was Nevills’ reluctance to let them handle a boat in whitewater. Jotter went on to earn her PhD, raise a family and teach at the University of North Carolina. Nevills started a successful river guiding business and led several more trips through the Grand Canyon. He became known as the “the world’s number one fast water man” but his career was cut short in 1949. During takeoff, his single-engine monoplane lost power and crashed outside of Mexican Hat, Utah, killing both him and his wife. Clover and Jotter published a paper on their findings in the Grand Canyon. It was the only botanical survey completed before the Glen Canyon Dam permanently altered much of the plant life. After a few more trips out West, she turned her attention south of the border. She traveled to Guatemala, Mexico and Haiti. When she retired, she moved to South Texas and died in 1983 at the age of 80. TELLURIDE THE MOST COLORADO PLACE ON EARTH. photo courtesy of Visit Telluride. TELLURIDE, COLORADO, is tucked in a picturesque box canyon with one way in and one way out as far as a paved route is concerned. The former mining camp found its second payload in snow, and the first chairs began turning in 1972. Today the ski resort is regularly considered the best in the West, according to ski vacationers the world over. The town of Mountain Village, actually on the mountain, was founded in 1995. It developed around the slopes, and many businesses and residences have sprouted among them. An impressive and free gondola system links the town of Telluride to Mountain Village well beyond the ski season. In reality, the tram system is just as much public transportation as it is ski lift. SEDONA OUT OF THIS WORLD. SEDONA, ARIZONA, just might be the most metaphysical place on Earth. Next to the pizza parlor in town you can get your palm read or your aura photographed. It seems there is a psychic on every other corner. It is also said to be home to several energy vortexes where the Earthâ&#x20AC;&#x2122;s magnetic forces can have powerful healing effects on the psyche. Whatâ&#x20AC;&#x2122;s really amazing in Sedona are the red rock canyons, mesas and buttes that surround this colorful town. Trails like the Hangover Trail, the Highline, Bell Rock and many more spin out in every direction, and the riding, hiking and running on them can be done just about year-round. #VANLIFE Everyone is living the van life to travel, but veteran Vernan Kee is going back to where he came. A bird's-eye view of the highline at Twin Buttes. photo by Alex Fuller. canyons. Their goal is to push the limits for what is possible. Different from slacklining, highlining is done far above the ground where a ground fall would be fatal, or at least catastrophic. Most wear a harness, tethered for safety. To set up an objective like Twin Buttes requires an extensive anchor system and a team to properly secure, tension and position the webbing in place, so the San Juan Riggers get to work. Highliner Sean Englund prepares to cross a 500-foot gap between Twin Buttes outside Durango, Colorado. photo by Weston Brock. second is a backup. Two people each with one of these lengths of line had to come together, along with a team of six other people to get the gear to the top and rig the line in a day. Cliff Moser brought one piece of webbing to match Thompson’s. Then a four-hour taping party at Sean Englund’s house was held to prepare the webbing and all the gear. Early the next morning, Thompson, Moser, Englund, Eli Roberts, Chris Mendoza and myself took off with our loads and headed for the buttes. Early on a Saturday morning, just as the wind eased up, Englund got on the line. Slowly he started to walk. His confidence was clear. He said he loves highlining because it is where his mind completely turns off. “It’s kind of like a forced meditation,” he said. “And I’m the kind of person who is always moving at full speed. But when I’m on a highline, UP ROPE everything slows down.” With a team on each butte, we started by walking As Englund walked the line, slow and a strong nylon thick string called paracord from one steady, everyone fell silent, their eyes butte to the other. Then a much heavier static rope was watching his continuous counterbalance, It’s like attached to the paracord and pulled across. The team their ears listening to his music on repeat. the whole would hold this rope like a deadly tug of war from one When Englund’s shadow and his body external butte to the other. Communication and focus are key in started to get closer to the other side, it world goes these moments. Finally, the two lengths of webbing are was becoming real. The ground rose to quiet,” he attached to the static rope and pulled across, elevating meet his body in the air. He sent the line said, “and all $1,600 worth of webbing that can’t be dropped into and walked off. there is to do the brush below for fear of damaging it. Even though The moment his feet left the webbing is walk. this special webbing is designed for highlining can and landed upon the top of the west butte, everyone let hold thousands of pounds, if it is damaged, it’s no loose with their excitement. Englund was alone on the longer safe. With the webbing in place, the primary other side, with tears of joy in his eyes. As Englund took and secondary lengths of webbing were individually it all in Thompson yelled, “I love you.” With the La Plata anchored to the rock. Mountains in the background, lightly covered with snow, It was Nov. 9 when the line was officially up. The wind picked up at Englund became the first person to send the Twin Buttes highline. that time and a storm was in the forecast. Efforts were bold, but no one Highlining is an activity that requires a team. But when a person is walked the line. The weather pushed the team back home. on the line, they are all alone. With their eyes trained off in the distance, There were two days left. Word had spread that the Riggers were set on a and their feet on a strip of webbing hundreds of feet above the ground, a project, and it drew a crowd. Highliner or not, the community came out. highliner has to embrace the moment and focus. Sean Englund highlines across Twin Buttes. photo by Weston Brock. Where you need to go. When you need to be there. Less travel time. More vacation time! Pets ride FREE in the cabin. No additional charge to bring your bike.